One of the best and priceless forms of advertising for Artists like me has to be through recommendations and word of mouth. Commissioning a Pet Portrait is an extremely personal thing and you want to make sure you get it right so when someone orders a portrait as they've seen my work from a friend then it's the highest accolade I could ask for. Some of you may remember the gorgeous Boris the Cockapoo that I painted a couple of months back and his lovely Mum Judy recommended me to her friend Penny. 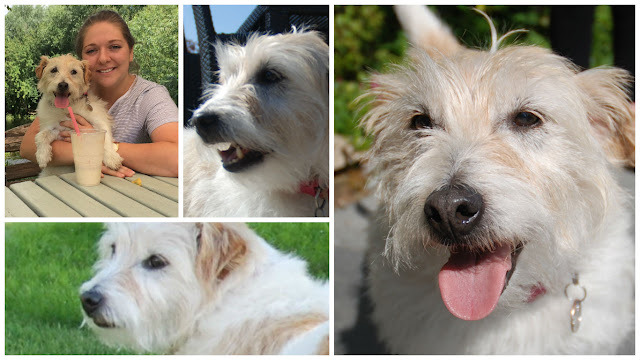 Penny got in touch to ask for a Portrait of the gorgeous Bertie as a present for her daughter and Bertie's Mum, Olivia. I popped over to the family home in Tarrant Keyneston to meet the lovely boy and as soon as I came into the driveway he was there to greet me with his cheeky smile! Thankfully it was a nice sunny day so we had a little photoshoot in the garden and it gave me a chance to get to know him and his quirks :) obviously this is the tough part of my job!! Penny also sent over some lovely pics of Bertie with his mum which really captured his smiley face and were perfect for me to create his portrait. We decided to go for a 20x20" canvas, head and shoulder shot, so that I could capture all the detail in his features. 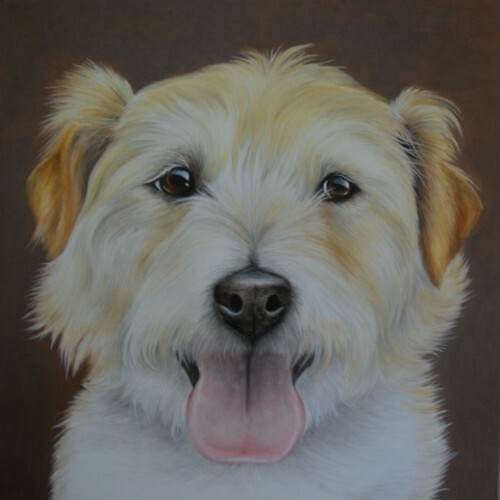 We also spoke about backgrounds, I tend to go for fairly plain, pale backgrounds but as Bertie has a pale colouring Penny suggested a brown background, something I've never tried before but have to say I was really happy with the result, it meant that he really stood out on the canvas and bought out the colour in his eyes. Penny gave the painting to Olivia on her birthday and emailed me to say - "Olivia absolutely loved Bertie's portrait and opened it with a big scream and squeal - and lots of amusing comments from her housemates 'how did you get him to sit still for long enough?' Etc! So it is certainly a winner. Thank you!" It's always great to hear!